Aylesbury FC drew the curtain down on a disappointing but ultimately satisfying season with an emphatic 5-0 win over Fleet Town at a warm and sunny SRD Stadium on Saturday afternoon. With the team safe from relegation, the temptation could have been to treat the clash as a stroll, but under the guidance of player-manager Davis Haule, that was never going to be the case and so it proved as Aylesbury collected victory in an attack-minded game. The five goals and three points see FC finish 19th in Division One Central with 44 points from 42 games. The team made a perfect start with an opening goal inside a minute. Alex O’Brien played in Aston Goss and with a deft flick, the winger poked the ball home for 1-0. Two quickfire chances followed afterwards before Aylesbury’s pressure paid off with a second when O’Brien converted Haule’s cross. Fleet’s David Cadete struck a shot just wide but the hosts continued to press with Goss’ free-kick whistling narrowly off target and Ty Deacon stinging the palms of Ryan Pryce. Keeper Pryce was forced off at half-time due to injury and substitute Brett Stanley was quickly brought into action, denying Haule, while opposite number James Weatherill thwarted Ben White. On 57 minutes, Deacon scored the goal of the game. Reminiscent of Gazza’s famous Euro 96 goal against Scotland, the young forward controlled a ball over the top with one touch before smacking home with his next. The game became a stroll thereafter and soon FC had a fourth. Charlie Hawtin was fouled in the box with the referee not hesitating in awarding a penalty which manager Haule stroked home with ease. 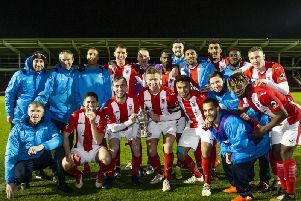 Substitute Harry Wood hit a venomous shot from all of 40 yards that Stanley did well to palm away, and Fleet should have had a consolation with two minutes a goal when awarded a penalty, only for White’s spot-kick to be brilliantly saved by Weatherill. Still the action was not over. Deep in injury time Goss patrolled the outside of the away box and when a chink of light appeared,he unleashed a powerful shot that rifled into the net to crown an excellent afternoon as FC’s season drew to a close.